South Carolina’s lowcountry has been heralded as a sportsman’s paradise, and with good reason. The ample array of estuaries, rivers, inlets, and the Atlantic Ocean means anglers are spoiled for choice when it comes to planning a day on the water. With expertly guided saltwater fishing charters, Therapy Fishing is proud to offer some of the best fishing trips in Charleston, SC. What makes the Therapy Fishing approach to Charleston saltwater fishing charters different? It just might be the attention given to the species diversity. Rather than aiming to “catch fish,” our fishing trips are designed to allow guests to target specific species, depending on season and habitat. Guests can experience the thrill of shark fishing, using the right bait and tackle to reel in a toothy whopper. Large shark varieties like tiger sharks and blacktip sharks are just two of the potential catches. Therapy Fishing also offers Charleston fishing trips designed around redfish angling. This species is a hard fighting and delicious fish that has been a major contributor to Charleston’s reputation as a fishing destination. Crowd pleasing flounder trips are also available. 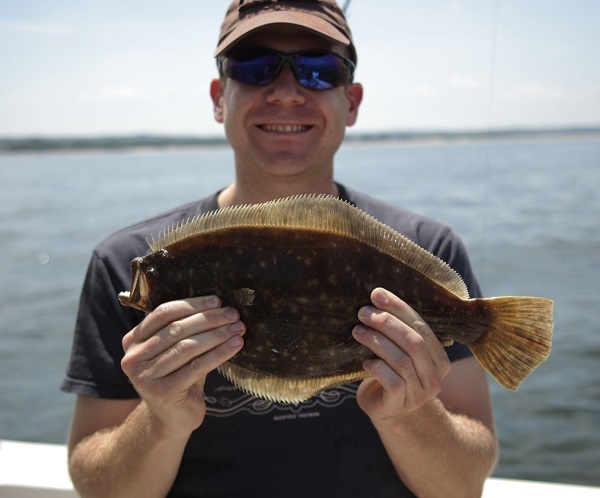 This flat fish makes for an exciting catch and even better photo opportunity. For the experienced fisherman, fly fishing trips are a truly special way to fish. Ample on-board casting space and premium tackle combine to ensure a one-of-a kind fly-fishing experience. Therapy Fishing is also pleased to offer fishing charters designed for families with children. Even the most novice-level member of your family can expect big fish and even bigger fun with these charters. We can also accommodate groups of up to six for a party boat fishing experience. Ample coolers and seating space mean your group can fish in style. Fishing trips in Charleston, SC are always special, especially when they’re led by an expert Charleston fishing guide. Therapy Fishing founder, Captain Adam, has years of experience exploring and fishing Charleston’s waterways. He’s happy to share his knowledge and always works with guests’ experience levels—ready to teach or simply take you to the action. Saltwater fishing charters are one of the best ways to experience the great outdoors. For the most engaging and entertaining fishing trips in Charleston, SC, book your excursion with Therapy Fishing today.